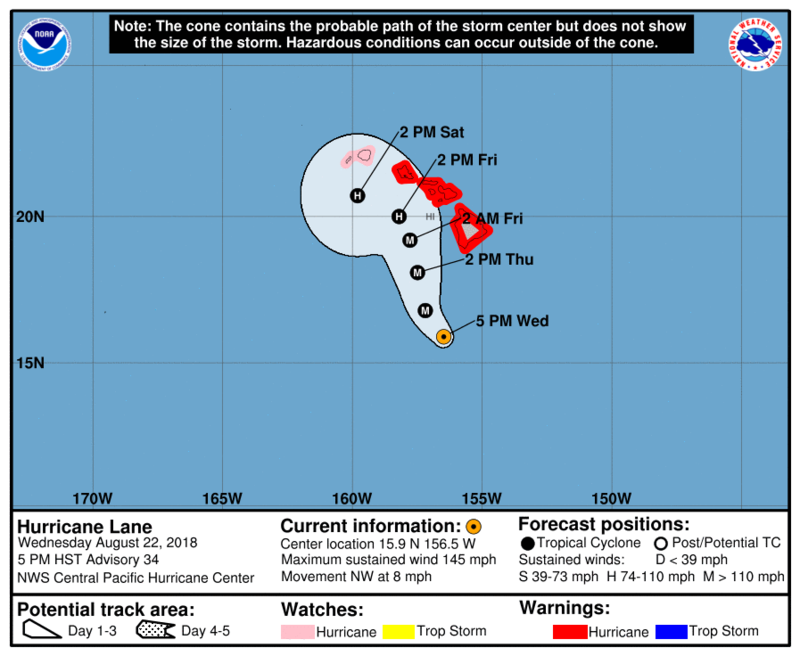 Hurricane Lane over the central North Pacific has max winds of 125 knots and was moving northwestward towards the Hawaiian Islands and is forecast to turn more towards the north during the next 24-36 hours. In 48-72 hours track guidance suggests that Lane will start turning back to a more westward track and the timing of that shift could make a significant difference over the Hawaiian Islands. Increasing wind shear will gradually weaken Land during the next 48 hours, with more rapid weakening thereafter. This entry was posted in Tropical Cyclones and tagged Hawaiian Islands, Hurricane, Lane, North Pacific, Storm, Tropical Cyclone. Bookmark the permalink.